Pablo Neruda was born Neftali Ricardo Reyes Basoalto on July 12, 1904, in Parral, Chile. His mother, a teacher, died of tuberculosis not long after he was born, and his father, a railway worker, discouraged his interest in poetry. A school principal, Gabriela Mistral, who later became a Nobel Laureate herself, encouraged his passion. The young man spent time translating the great poets, such as Blake and Shakespeare, but credited Walt Whitman with being one of his strongest influences. In the early 1920s, when Basoalto began contributing articles to a literary journal and publishing his own poetry, he adopted a pen name to avoid conflict with his family. Basoalto became Pablo Neruda in homage to 19th-century Czech poet Jan Neruda, but he didn’t make the pseudonym legal until 1946. When “Twenty Love Poems and a Song of Despair” was published in 1924, Neruda became a celebrity. As in the Latin American tradition, poets were often honored with diplomatic assignments. 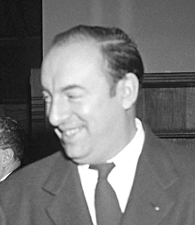 Neruda’s political career began in earnest in 1927, with honorary consulships taking him to Ceylon, Burma, Singapore, Java, Barcelona, Buenos Aires and Madrid. In 1933, while stationed in Buenos Aires, he met Spanish poet Federico Garcia Lorca, who became a mentor for him. Neruda was in Madrid when the Spanish Civil War broke out in 1936. He became a strong supporter of the republican cause and a devoted communist. The war, particularly the 1937 execution of Garcia Lorca by nationalist forces, greatly influenced his writing. He poured his passions into his poetry with his collection of poems, “España en el Corazón” (1937). In 1939, he began rewriting his “Canto General de Chile,” “transforming it into an epic poem about the whole South American continent, its nature, its people and its historical destiny,” writes the Nobel Foundation. It took him more than a decade to complete the work, which contained more than 250 poems in 15 sections; it was released in 1950, while Neruda was in exile in Mexico, and it spread to the Chilean underground. In the 1940s, his criticisms of Chilean President González Videla forced him underground and then into exile in 1949. He returned to Chile in 1952, wealthy and respected, and was awarded the Nobel Prize for Literature in 1971. Pablo Neruda succumbed to leukemia in Santiago, Chile, on September 23, 1973. As his life had been highly political, so too was his death. Coming just 12 days after the overthrow of communist President Salvador Allende, his funeral became a protest against the dictatorship of Augusto Pinochet, with the populace turning out in force. The government ignored the poet’s wish to be buried at the coastal city of Isla Negra, instead interring him in Santiago. It would take nearly two decades before Neruda was exhumed and reburied in Isla Negra. By 2004, when the poet’s 100th birthday was celebrated, Chile planned to award humanities medals in his name at their embassies around the world, as well as commemorate the day at home with parades and poetry readings. A photographic retrospective of Neruda’s funeral can be found on Flickr. Neruda is a central character in the acclaimed 1994 Italian film, “Il Postino” (“The Postman”), a charming and lyrical love story based on true events.